The other day while walking along Gran Via de les Corts and near Passeig de Gracia I spotted this well decorated showcase. At first, I was just interested in the colorful display but then noticed the sign specifying the shop had been founded 60 years ago and decided to google the name. 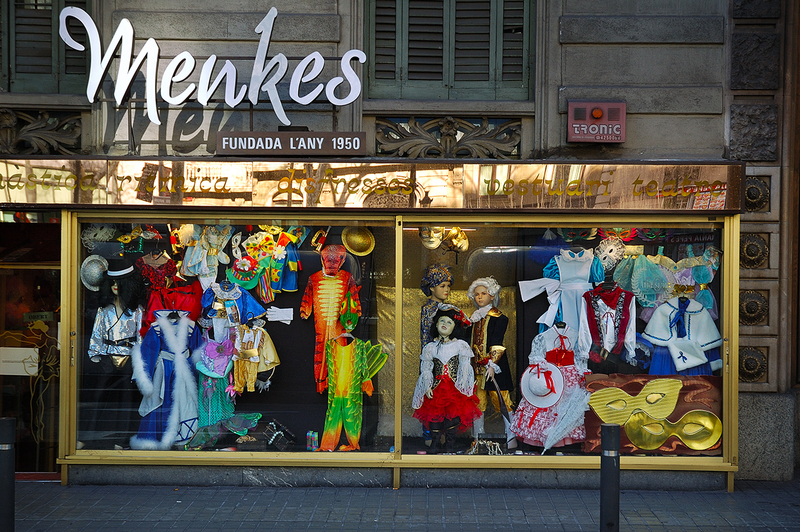 It happens that the company has stores all over Spain and also in Paris or New York and not only deals with costumes but also distributes and manufactures flamenco items or tailors for the theater, etc. As I think some shops well deserve the free ad I give you the link and leave it up to you whether to spend your precious time following it or not: Menkes. And now that we are at it, I wonder what your opinion is about indirectly promoting brands, companies or products when writing an article due to the very nature of the content or the photograph in this case. I have no problem with that. I guess you as a good blogger would also tell us any bad thing that might happen. Oh, and it is a nice window. A very colorful, fun, interesting store front! Nice snap! yeah, feeling proud of Catalan pymes!!! I agree with Steffe, no problem. There is always smth artificial in commercial info in comparison to personal experience's info and it's OK. I don't have a problem with that either! Everthing today is composed of "product placement" anyway and you have a fantastic photo of this storefront, so why not share it with your readers? I love costume shop displays, the more colourful the better. I have no problem with brand promotion - I hate pop up ads, but as far as I'm concerned, you can mention anything you like in your posts. Giving hyper links is good because one can immediately follow them if interested in the product mentioned.